My sculpture Living in Harmony with an Ancient Being. 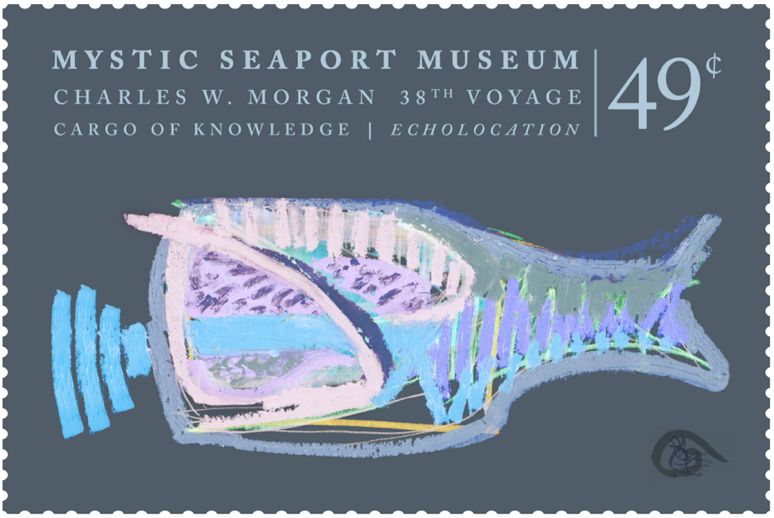 Sound; Communication is exhibited at Mystic Seaport The Museum of America and the Sea as part of “Journey of Transformation: An Exploration of Our Evolving Relationship With the Whale” by Dalvero Academy, from 2015–2016. to death. The sperm whale has the largest brain of any animal on earth, more than five times heavier than a human. Many whales possess some of the most sophisticated cognitive abilities among all mammals (Marino). My sculpture Living in Harmony with an Ancient Being. Sound; Communication, (located outside next to the Greenmanville Church) represents the need to interact and communicate with this ancient being. Harmony, about a quarter the size of a female sperm whale, the shape of a sperm whale is cut out of sapele mahogany—wood as the symbol of life—in multiple pieces, the first piece three quarters the entire size, isa void space where the brain would be housed but cut open as the Yankee whalers did. The interior head is now replaced with aluminum wind chimes tuned to the musical notes a and e. The wind chimes create a space in which one dwells and balances energies to bring about a dialogue through the mindful act of listening. This also signifies the spiritual call from the many tribes that depended on the whale for sustenance. A stainless steel rod follows the pattern of echolocation symbolizing the importance of sound to the sperm whale and also how much we still need to learn from this ancient being. The process of exploration takes place during listening—not only to the call of nature but to oneself. My desire is to create space for a dialogue to reflect on the moral obligation or the spiritual relationship between humanity and the Earth to extend the traditional boundaries of ethics from solely including humans to including the non-human world. The sculpture is made from sepele mahogany, stainless steel, and aluminum wind chimes.